Thanks for sharing this review, Matt. It sounds interesting. We want our students to continue reading over the holidays for their reading ability to be maintained. Setting reading, though, can be counter-productive. Motivation, choice and interests will definitely play an important part in establishing independent and lifelong reading habits. It can sometimes be difficult to know how best to establish that. Hi Norah, thanks for commenting. We are trying to figure that out ourselves. What has worked for you, or what have you tried? One approach is bringing literacy intervention for older students into the classroom. For example, in our school we are going to facilitate a book club during our intervention block for 4th/5th grade students. I am sure I will write more about this, so stay tuned! The book club sounds like a great idea. I think choice is a very important ingredient. Michael Rosen talks about giving children the opportunity to browse – browse in a library, in a bookstore, on a bookshelf – and to select what is of interest regardless of the measured ‘reading level’. He says that interest, and I tend to agree, is the greatest motivator. I always give books as gifts and, while I believe in choice and self-selection, I had not before considered the importance of browsing in quite this way. Too often we are ready to jump in and steer students in directions that we think are appropriate for them. Very true Norah. It happens more frequently as the kids go up through the grades. Choice gets thrown out the window in favor of rigor and the classics. I have nothing against the classics – I think every kid should read 1984 before they leave high school – but students at every age still need to be able to choose what they want to read and have time to read it. Definitely! It is as the kids go up through the grades (get older) that they need to be developing more independent skills. Self-selection is one of those. If they are not shown how, or given time and opportunity, to find books that are of interest to them at school, it is unlikely that they will be able to develop effective habits as lifelong readers. This is in my TBR pile, Matt. Thanks for sharing your review! You are welcome Susan – you will enjoy it! Thank you for sharing the study. I will try to see if I can access it. Hi, Matt. I was so happy to see this review on your blog because of several reasons, one of which is that Carrie Cahill is my Assistant Superintendent. 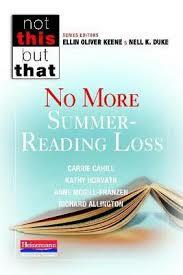 We will begin talking to our teachers soon about summer reading and how we can work to prevent summer reading loss. I am anticipating a lot of work around this topic in May in our district, and I’ll keep you posted on any new ideas! How lucky you are to have Carrie as an administrator in your school district. I look forward to hearing about the innovations you all come up with, Dana.